When a patient registry is constructed for a project funded by the Practical Research Project for Rare/Intractable Diseases or the Research Project on Rare/Intractable Disease, RADDAR-J will provide appropriate support for the construction with assured data quality (e.g., accuracy, reliability, integrity, and availability) as well as support to enable standardization. Specific details are provided below. *The following support will be available from FY2018. The above can be customized according to the needs of the individual research group. The use of our infrastructures will enable effective an efficient construction and operation of a registry. The above are sample templates prepared based on the relevant laws, regulations, and guidelines, to meet all ethical requirements necessary in constructing a registry in collaboration with RADDAR-J. In order to support various types of registries, we have prepared six registry patterns. Users can select the most suitable pattern, and customize the standard documents according to the method and content of their registry. These standard systems can be customized in accordance with the research proposal and case report form of each registry. For each registry, research grants will be used for outsourcing the customization of the standard system and covering the operating cost of the server. Estimated cost will vary depending on the volume and level of the registry. By integrating registry information, RADDAR-J aims to construct an information platform that will dramatically improve the prospects for the elucidation of the overall picture and pathology of intractable diseases. RADDAR-J will also promote research on intractable diseases through the secondary use of the integrated information. The users of RADDAR-J will therefore be asked to share their data when they construct a patient registry using the standard platform. Our aim is to minimize the burden on study groups and maximize their research output by constructing a registry that covers a diversity of intractable diseases. We kindly ask for your understanding. New findings obtained by integrating information from each registry and from collaborative analysis on genomic and clinical information will be made available to all research groups involved. This ethics committee was adopted by the Project for Development of Central Institutional Review Board in 2017 as a “clinical research core hospital” as specified in Article 4-3, Paragraph 1 of the Medical Care Act. 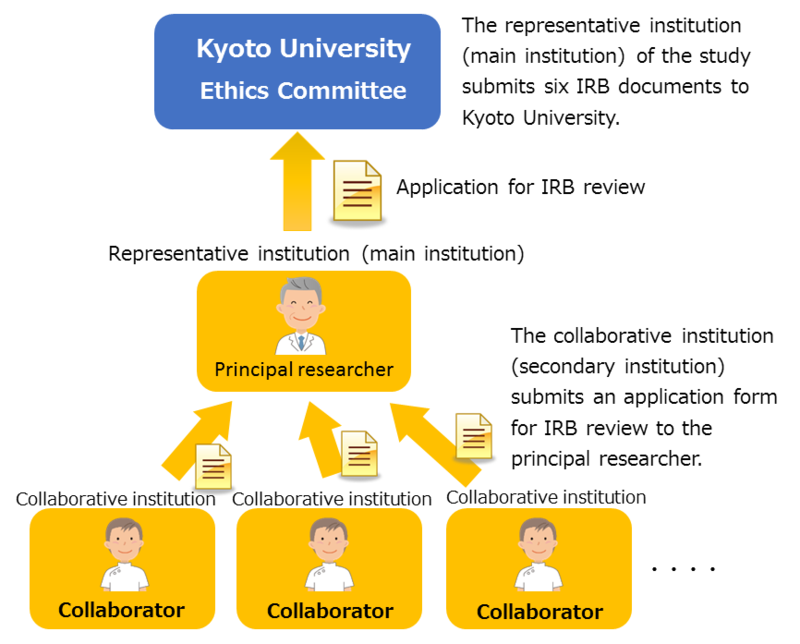 When submitting an application to the Kyoto University Ethics Committee as the Central Institutional Review Board, submit the documents prescribed by the Kyoto University Graduate School of Medicine and Faculty of Medicine and Kyoto University Hospital Ethics Committee. The procedure to add new collaborators are simple and do not require much time or effort. If the Central Institutional Review Board,is used, a separate application for IRB review at the applicant’s research institution is, in principle, not required. Documents such as the annual progress report will be collectively reviewed by the Central Institutional Review Board. The three-year progress report may also be reviewed collectively. In addition, applications for addition of collaborative institutions will be fast and simple. If required, the principal investigator should submit documents for IRB review at his/her research institution before submitting an application for IRB review at the Central Institutional Review Board.